. 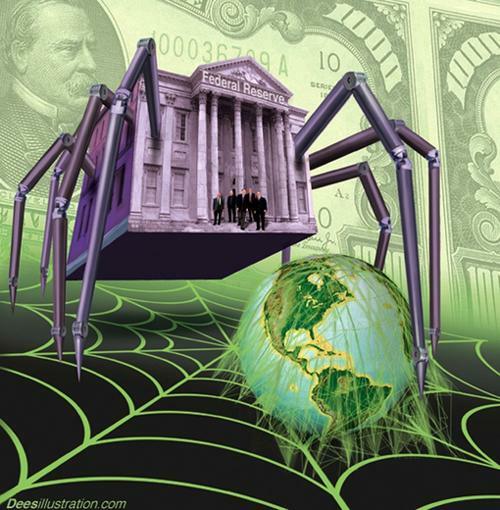 .Of all the scams, the worldwide banking system is one of the most mind-boggling. Never mind the entire false premise of fiat money and the debt system, that vast amounts of this illusory “currency” get shifted every micro-second just begs deceit and piracy. Trouble is, if you “buy into it” you’re already ensnared, and it’s either eat, or be eaten. That’s their design. The estimated value of the Rothschild family’s total holdings is at 500 Trillion dollars. So what. The entire planet is supposedly “owned” by a very small percentage of people. So? Can anyone “own” anything? Ownership is a temporary power trip for the unenlightened–everything always gets passed on. Like the temporary unit we all live in called our body, it’s an illusion that anyone can “live forever” physically never mind truly “possess” anything if we look at things truthfully. That would be fine if it was just a matter of perception. Trouble is, these ultra-possessive creeps called the global elite or Illuminati impose their system of temporal power beliefs on the rest of us. Either we play the game their way, or we’re locked out of the playground and cut off from supplies by their hired thugs. It’s a beautiful planet with lots of beautiful people, but the world “system” is very ugly and run by non-empathetic psychopaths. But again, it’s all temporal. The recent economic manipulations have made a lot of things very obvious. While the MSMedia has tried to downplay or ignore these revelations, the globalist central bankster cartel is being exposed regularly. While people are pounding on the obvious manipulation of and by the private Federal Reserve Bank hoax and Goldman Sachs and the like, there’s another part of that story few have noticed. What is the Depository Trust & Clearing Corporation? ﻿﻿There is a busy little private company you probably never have heard about, but which you should. Its name is the Depository Trust & Clearing Corporation. See their website. Looks pretty boring. Some kind of financial service thing, with a positive slogan and out there to make a little business. You can even get a job there. Now, go and take a look at their annual report. Starts with a nice little Flash presentation and has a nice message from the CEO. And take a look at the numbers. It turns out that this company holds 23 trillion dollars in assets, and had 917 trillion dollars worth of transactions in 2002 alone. That’s trillions, as in thousands of thousands of millions. 23,000,000,000,000 dollars in assets. As it so turns out, it is not because DTCC has a nice website and says good things about saving their customers money that they are trusted with that kind of resources. Rather it is because they seem to have a monopoly on what they do. In brief, they process the vast majority of all stock transactions in the United States as well as for many other countries. And – and that’s the real interesting part – 99% of all stocks in the U.S. appear to be legally owned by them. And why is this mega-monopolizer so hidden from public scrutiny? It turns out it’s part of the Federal Reserve Bank. Big surprise. These same owners and players mandated that all transactions have to go through their subsidiary. And not just go through it for all the profits and asset holding interest the transaction will bring, but they are given ownership of everyone’s assets in the process! In the old days, when you owned stocks you would have the stock certificates lying in your safe. And if you needed to trade them, you needed to get them shipped off to a broker. Nowadays that would be considered very cumbersome, and it would be impractical to invest via computer or over the phone. So the shortcut was invented that the broker would hold your stocks instead of you. And in order for him to legally be able to trade them for you, the stocks were placed under their “street name”. I.e. they’re in the name of the brokerage, but they’re just holding them in trust and trading them for you. And you’re in reality the beneficiary rather than the owner. Which is all fine and dandy if everything goes right. Now, it appears the rules were then changed so the brokers are not allowed any longer to put the stocks in their own name. Instead, what they typically do is to put the stocks into the name of “Cede and Company” or “Cede & Co” or some such variation. And the broker might tell you that it is just a fictitious name, and will explain why it is really more practical to do that than to put it in your name. The reason the public doesn’t know about DTC is that they’re a privately owned depository bank for institutional and brokerage firms only. They process all of their book entry settlement transactions. Jim McNeff (Director of Training for the DTC at the time) said “There’s no need for the public to know about us… it’s required by the Federal Reserve that DTC handle all transactions”. The Federal Reserve Corporation, a/k/a The Federal Reserve System, is also a private company and is not an agency or department of our federal government. The Federal Reserve Board of Governors is listed, but they are not the owners. The Federal Reserve Board, headed by Mr. Alan Greenspan [now Bernanke], is nothing more than a liaison advisory panel between the owners and the Federal Government. The FED, as they are more commonly called, mandates that the DTC process every securities transaction in the US. How convenient. Talk about inside job. It’s no wonder that the DTC (including the Participants Trust Company, now the Mortgage-Backed Securities Division of the DTC) is owned by the same stockholders as the Federal Reserve System. In other words, the Depository Trust Company is really just a ‘front’ or a division of the Federal Reserve System. Like the man said, something to think about. Typical of the thief–distracts you with one hand while picking your pocket with the other. Only this thing is a multi-tentacled monster, and it’s now going for the jugular..